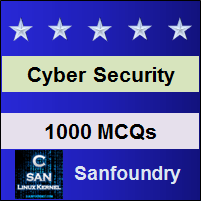 This set of Cyber Security Multiple Choice Questions & Answers (MCQs) focuses on “Corporate Cyber Security”. 1. _____________ is a malicious method used by cyber-criminals to trick a user into clicking on something different from what the user wants. Explanation: Clickjacking is a malicious method used by cyber-criminals to trick a user into clicking on something else which is illicit from what the user wants. The single click usually redirects the employee to a strange site from where infected files get downloaded into the system of the employee. 2. Through the clickjacking attack, the employee’s confidential ______________ may get leaked or stolen. Explanation: Through clickjacking, the employee’s system may get compromised by an infected program, trojans or spyware which got downloaded in the background automatically as the user fell into the trick of an attacker. 3. Which of the following is not a proper aspect of user integration? Explanation There are 3 main aspects that need to keep in mind when putting together new employees or users into an application. These are: Representing users in the database, Access control, and Employee’s authentication. 4. It is very important to block unknown, strange and ______________ within the corporate network. Explanation: It is very important to block unknown, strange and infected sites within the corporate network, by the network administrator so that any employee may not accidentally access those sites or open infected sites by means of clickjacking or URL-redirection techniques. 5. Every employee of the firm must need to have some basic knowledge of cyber-security and types of hacking and how they are done. Explanation: Every employee of the firm must need to have some basic knowledge of cyber-security and types of hacking and how they are done. This will make each employee aware of the various malicious activities and can report to their seniors in this regard. 6. Use of _______________ can bring external files and worms and virus along with it to the internal systems. Explanation: Use of pen drive to bring your work from home tasks to office systems may bring worms and virus along with it (if your home system is infected with any malware or infected programs) and may cause harm to your office systems. 7. A ____________ takes over your system’s browser settings and the attack will redirect the websites you visit some other websites of its preference. Explanation: Browser hijacking is a technique that takes over your system’s browser settings and the attack will redirect the websites you visit some other websites of its preference. 8. ________________ has become a popular attack since last few years, and the attacker target board members, high-ranked officials and managing committee members of an organization. Explanation: Ransomware has become a popular attack since last few years, and the attacker target board members, high-ranked officials and managing committee members of an organization; where the ransomware compromise the system by encrypting all files and ask for some ransom in order to unlock or decrypt all files. 9. ________________ important and precious file is a solution to prevent your files from ransomware. Explanation: Keeping a secured backup of the important and precious file is a solution to prevent your files from ransomware. The backup should have to be made in some secured cloud storage of any other location (server) in an encrypted form. 10. ___________ is the technique to obtain permission from a company for using, manufacturing & selling one or more products within a definite market area. Explanation: Product licensing is the technique to obtain permission from a firm or organization for using, manufacturing & selling one or more products within a definite market area. This is done by the company for security reasons and usually takes a royal fee/amount from its users. 11. Which of the following do not comes under security measures for cloud in firms? Explanation: For keeping cloud service secure and fully working, firewalls, encryption mechanisms and load-balancers are used but antivirus is not used it could for any security purpose. 12. It is important to limit ____________ to all data and information as well as limit the authority for installing software. Explanation: It is important to limit employee access to all data and information as well as limit the authority for installing software. Otherwise, any employee with illicit intention may install programs that are either pirated version or may cause damage to the internal corporate network. Explanation: One must isolate payment systems and payment processes from those computers that you think are used by strangers or may contain keyloggers. Otherwise, your card details and PIN may get compromised. 14. If you’re working in your company’s system/laptop and suddenly a pop-up window arise asking you to update your security application, you must ignore it. Explanation: If you’re working in your company’s system/laptop and suddenly a pop-up window arise asking you to update your security application, you must verify it once with the senior member, or tech-department if you feel it is for the first time, otherwise you must not skip updating your system security applications.